For each diagram, describe a translation, rotation, or reflection that takes line $\ell$ to line $\ell’$. Then plot and label $A’$ and $B’$, the images of $A$ and $B$. Use a piece of tracing paper to trace lines $a$ and $b$ and point $K$. Then use that tracing paper to draw the images of the lines under the three different transformations listed. What is the image of two parallel lines under a rigid transformation? Translate lines $a$ and $b$ 3 units up and 2 units to the right. What do you notice about the changes that occur to lines $a$ and $b$ after the translation? What is the same in the original and the image? Rotate lines $a$ and $b$ counterclockwise 180 degrees using $K$ as the center of rotation. What do you notice about the changes that occur to lines $a$ and $b$ after the rotation? Reflect lines $a$ and $b$ across line $h$. What do you notice about the changes that occur to lines $a$ and $b$ after the reflection? When you rotate two parallel lines, sometimes the two original lines intersect their images and form a quadrilateral. What is the most specific thing you can say about this quadrilateral? Can it be a square? A rhombus? A rectangle that isn’t a square? Explain your reasoning. 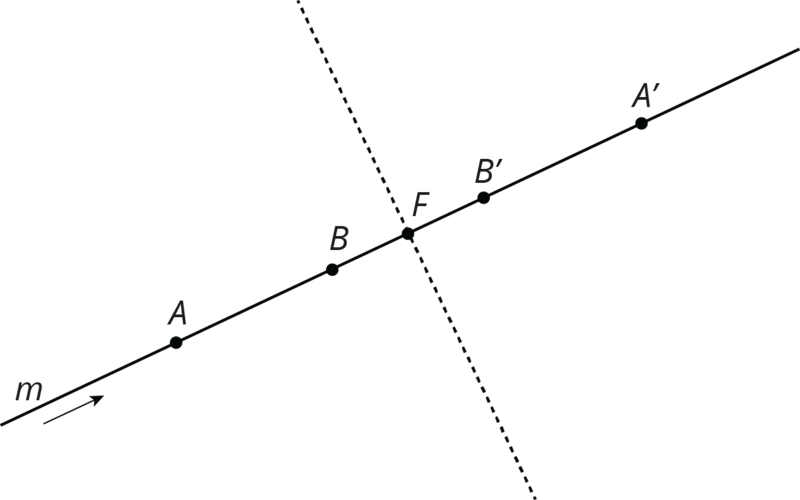 The diagram shows a line with points labeled $A$, $C$, $D$, and $B$. On the diagram, draw the image of the line and points $A$, $C$, and $B$ after the line has been rotated 180 degrees around point $D$. Label the images of the points $A’$, $B’$, and $C’$. What is the order of all seven points? Explain or show your reasoning. 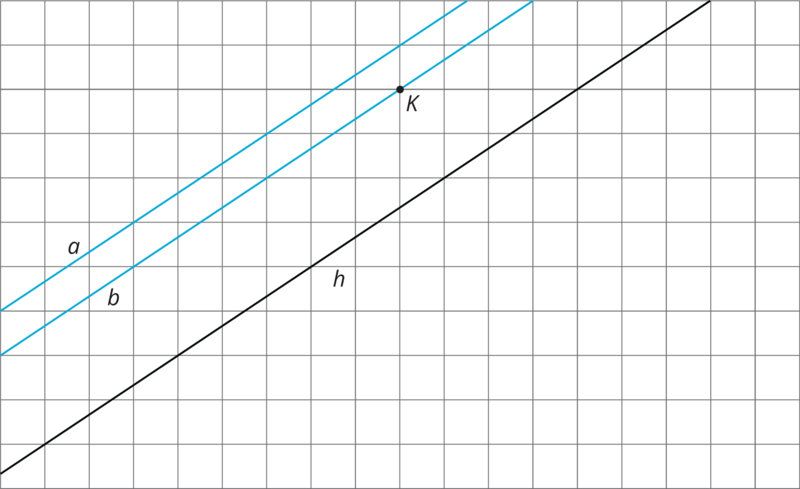 The diagram shows a line with points $A$ and $C$ on the line and a segment $AD$ where $D$ is not on the line. Rotate the figure 180 degrees about point $C$. Label the image of $A$ as $A’$ and the image of $D$ as $D’$. 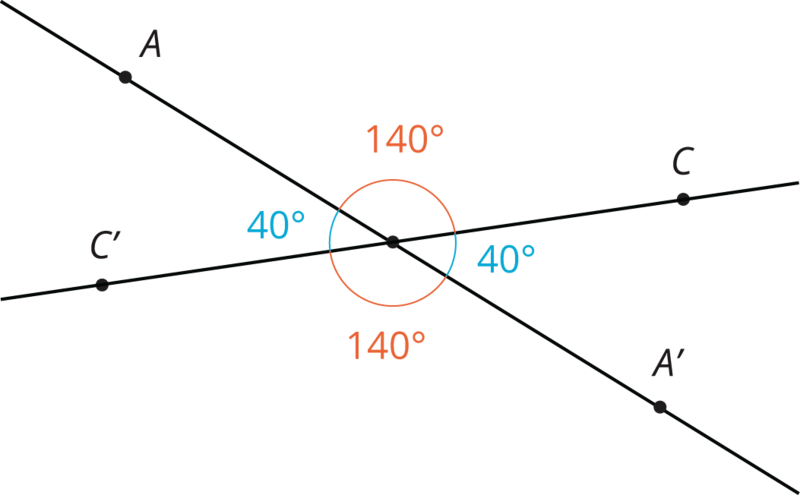 What do you know about the relationship between angle $CAD$ and angle $CA’D’$? Explain or show your reasoning. 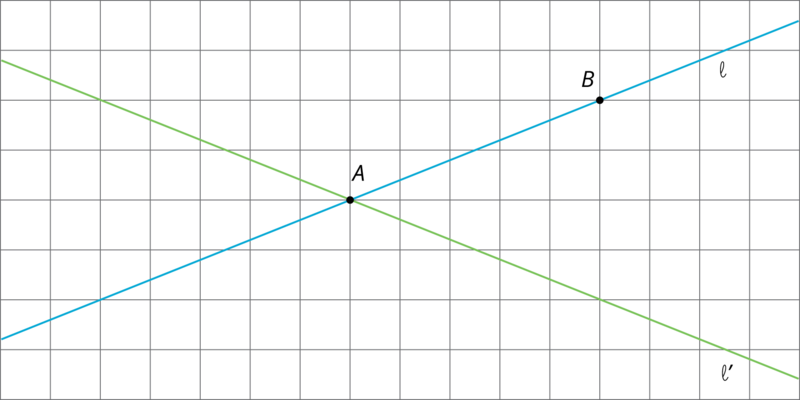 The diagram shows two lines $\ell$ and $m$ that intersect at a point $O$ with point $A$ on $\ell$ and point $D$ on $m$. Rotate the figure 180 degrees around $O$. Label the image of $A$ as $A’$ and the image of $D$ as $D’$. What do you know about the relationship between the angles in the figure? Explain or show your reasoning. A rigid transformation of a line is a line. 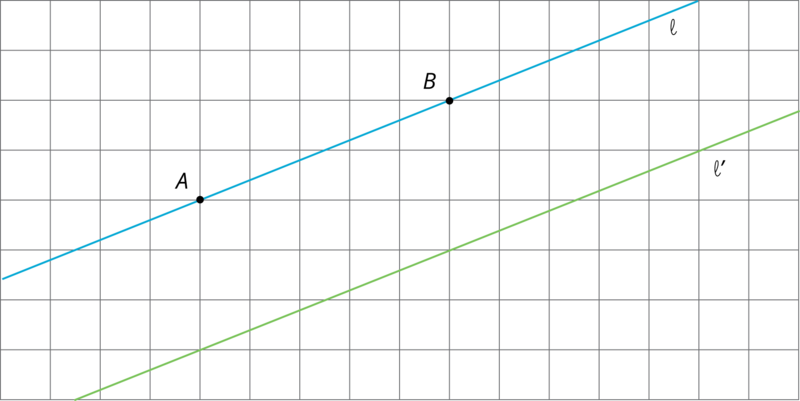 A rigid transformation of two parallel lines results in two parallel lines that are the same distance apart as the original two lines. A translation parallel to the line. The arrow shows a translation of line $m$ that will take $m$ to itself. A rotation by $180^\circ$ around any point on the line. A $180^\circ$ rotation of line $m$ around point $F$ will take $m$ to itself. A reflection across any line perpendicular to the line. A reflection of line $m$ across the dashed line will take $m$ to itself. Rotating both lines by $180^\circ$ around $O$ sends angle $AOC$ to angle $A’OC’$, proving that they have the same measure. The rotation also sends angle $AOC’$ to angle $A’OC$. A pair of vertical angles is a pair of angles that are across from each other at the point where two lines intersect. There are two pairs of vertical angles.